In this section we carry Medieval Horse Armour, Horse Mannequin, Horse displays, Chamfron, Spurs, Medieval Spurs, Norman Spur and Gothic Chamfron. Quality pair of Churburg Spurs, solid brass medieval spurs. Includes leather straps and buckles. Quality pair of Crusader Spurs. Includes leather straps and buckles. Two piece Etched Chamfron with decorative etched detail made from hybrid polyurethane. This armor is full sized. 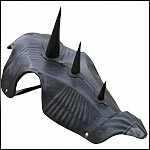 Highly decorative full size fluted horse Gothic Chamfron made from hybrid polyurethane. Horse Trapper is a medieval horse trapper or caparison. The Trapper or Caparison is a covering, of cloth displaying a coat of arms. Matching banner and surcoat available. Jousting, Re-enactments, SCA and LARP events. This Horse Trapper with double sided banner and matching knights surcoat has a Rampant Lion Charge. The Trapper or Caparison is a covering, of cloth displaying a coat of arms. Jousting, Re-enactments, SCA and LARP events. Quality pair of Mini Norman Spurs, solid brass. Includes leather straps and buckles. Mini refers to the size of the point, and not the overall dimensions. Medieval Knights Spurs - This quality pair of functional, hand forged, steel medieval spurs can be Custom sized to your measurements. Our Horse Trapper Crown Shield is a medieval horse trapper or caparison. The Trapper or Caparison is a covering, of cloth displaying a coat of arms. Matching banner and surcoat available. Jousting, Re-enactments, SCA and LARP events. Our Horse Trapper with Horse Charge is a medieval horse trapper or caparison. The Trapper or Caparison is a covering, of cloth displaying a coat of arms. Matching banner and surcoat available. Horse Trapper Rampant Lion Charge or medieval horse trapper or caparison. The Trapper or Caparison is a covering, of cloth displaying a coat of arms. Matching banner and surcoat available. Jousting, Re-enactments, SCA and LARP events. Our Horse Trapper is available with matching knight's Surcoat and double sided Banner. The Trapper or Caparison is a covering, of cloth displaying a coat of arms. Jousting, Re-enactments, SCA and LARP events. Horse Trapper Eagle Charge or medieval horse trapper or caparison. The Trapper or Caparison is a covering, of cloth displaying a coat of arms. Matching banner and surcoat available. Jousting, Re-enactments, SCA and LARP events. Horse Trapper with Logenze Charge and Eagle is a medieval horse trapper or caparison. The Trapper or Caparison is a covering, of cloth displaying a coat of arms. Matching banner and surcoat available. Jousting, Re-enactments, SCA and LARP events. Quality pair of Medieval Rowel Spurs, solid brass medieval spurs. Includes leather straps and buckles. Quality pair of Norman Spurs, solid brass. Includes leather straps and buckles. This quality pair of functional, hand forged, steel medieval spurs are sized to your shoe measurements.